When was the last time you felt accomplished? For me, it was when I resisted turning to my Seamless app two weeks ago as I headed home, starving from the gym. Instead, I walked to Fairway and picked up a pack of chicken breast and sweet potatoes to make this awesome Thai Red Curry. As I enjoyed this somewhat healthy meal which took me less than 30 minutes to make, I felt a true sense of accomplishment. I felt like a magician who was able to make a decent meal just appear on my dining table (OK - coffee table - who are we kidding here? This is New York City!) almost as quickly as my delivery guy. Who am I? Rachel Ray?? This recipe was first shown to me by a Thai friend in college. Prior to this, the only time I would have Thai curry is via takeout. 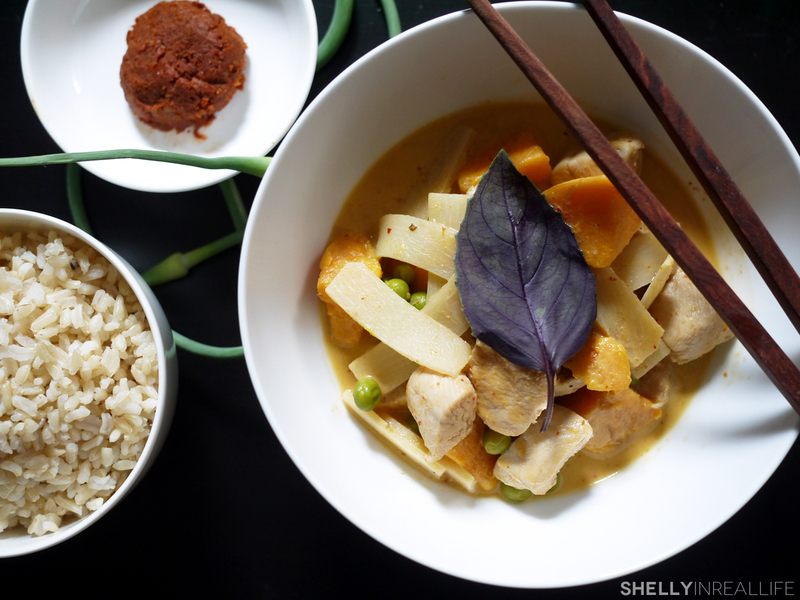 When we made this curry together, I was amazed at how quick and easy it was to put together. 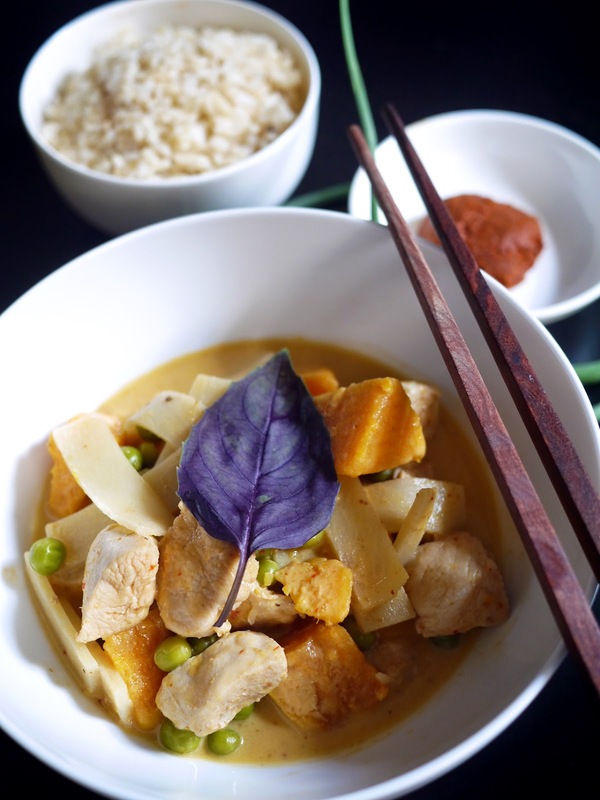 Learning this recipe was a game-changer - I have not spent money ordering red curry ever since. Instead, I just made sure to keep some key ingredients in my pantry: coconut milk, red curry paste and bamboo shoots. I love this curry because I can usually incorporate whatever fresh or frozen veggies I have on hand. This time, I added frozen peas, however, I have in the past added spinach, red bell peppers, green beans, carrots, honestly you name it! Since the sauce is made with a fragrant red curry paste and rich coconut milk, this recipe is also very forgiving. It's like the Easy Mac of Thai recipes. To add to all of this curry love, I also love being able to control what exactly goes into my curry. 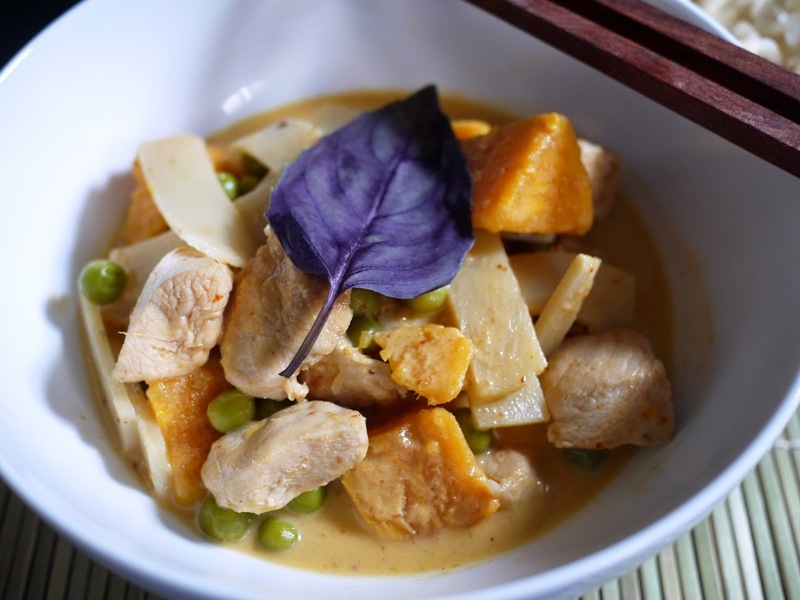 In this healthier version to your typical restaurant red curry, I added chicken breast as the protein and sweet potatoes instead of regular potatoes for a more complex carb. 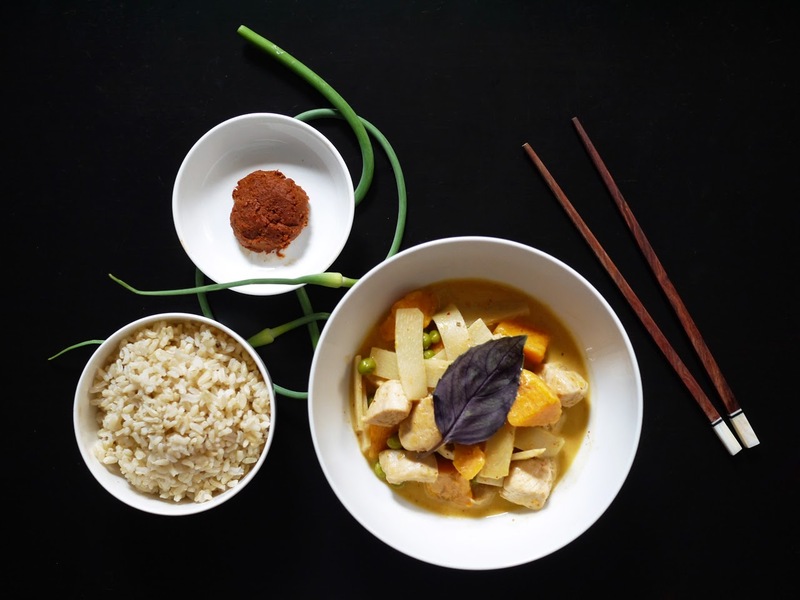 Sugar is also a very common ingredients in curries since it helps balance the heat from the red curry paste, but making it a home means I can control how much sugar is added (I don't add too much, but you can adjust to your tastes). The final ingredient that always goes into my curries is bamboo shoots. I love how the sauce clings onto the crunchy shoots and gives it extra texture. I will actually even eat just the curry with bamboo shoots in place of rice. When that happens, I usually wake up as a panda bear. But seriously guys, this quick recipe is great for any weeknight and will make you feel great about yourself for sticking to your guns and not ordering deliver the moment you feel hungry. As a bonus, it tastes even better as leftovers since the flavors of the curry melds together in the fridge overnight - guess I know what I'm eating for lunch tomorrow! 1. Cook curry paste & chicken. In a medium pot, heat coconut oil in medium-high heat. When oil is hot, add red curry paste and cook until fragrant - about 1 minute. Add chicken and stir well with the curry paste. Evenly brown most sides. 2. Add coconut milk & simmer. Add sweet potatoes, coconut milk, bamboo shoots. Bring to a soft boil and immediately turn down heat to medium-low to a strong simmer. (I've had my curry curdle when the coconut milk over boil - just like milk would). Cover and cook for about 10 minutes, or until your sweet potatoes are softened. When your potatoes are ready, add your more delicate veggies - frozen peas for me today. 3. Season & serve. Add sugar, fish sauce. Taste the curry and adjust flavors to your liking, more sugar, salt, etc. Also, take note if you want your curry spicier, you can add more curry paste at this point, but for next time you should add your desired amount in step one - remember though, 1 tablespoon goes a long way! Garnish curry with basil, serve with rice. *Shelly's note about coconut milk: Be sure you're using coconut milk from a can, and not from a large carton (like almond milk). The flavors from coconut milk from a can is richer and more flavorful as it's not diluted with extra water. Also, be careful not to try to substitute with cream of coconut as I have done - cream of coconut in a can is waaaaay sweet and not the right coconut milk to do the job. 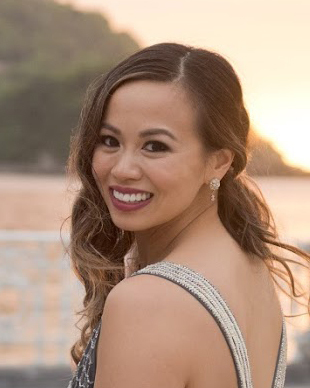 Finally, Trader Joe's sells a light canned coconut milk which is lighter in calories, but the taste overall just doesn't turn out as flavorful as the regular version in a Thai curry. I wouldn't skimp on the calories here.